Luminess Tan™ is a major breakthrough in home self tanning. Because so little is known about airbrush tanning, it is easily confused with spray tanning. Airbrush tanning is the ultimate way to apply the smoothest, most natural lasting sunless tan. The secret is in the exact control application, which provides the most flawless results. What we thought: Pardon the poor picture and lighting quality...I didn't think you'd want to blinded by the whiteness of the leg on the left, which is the "before" leg:) The leg on the right is after I applied the Luminess Tan with the use of the handy airbrushing kit. I was impressed with the simplicity of this kit. I was a little intimidated at first, but with a little practice, the end result was nice. I prefer the Luminess Tan airbrushing system over the tanning lotions I've tried because it is easier to apply a more even and realistic looking tan. You can change the depth of the color by getting closer or farther away from your target area. If you mess up, it is easy to fix if you act quickly. The system is easy to set up, use and clean up. Results are immediate and the system pays for itself quickly if you are used to tanning at a salon and paying for a membership. I would personally much rather get a safe, quick tan at home than lay outside or in a tanning bed. Buy It: You can find airbrushing kits for flawless makeup and tanning at Luminess! 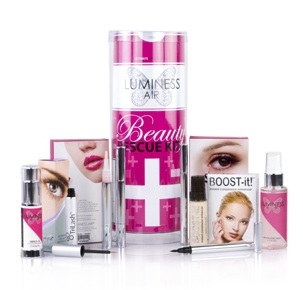 Win It: Luminess Air has generously offered one ABCD Diaries reader a Beauty Rescue Kit which features 8 full size Luminess products that can be used with or without an airbrush! Packed full of fabulous goodies like Boost-It, Lip Rescue Duo, Tattoo Eyeliner Pen & Filler Duo, Minus-10, TriLash and Revitalizing Mist this kit will help revitalize your everyday makeup routine. To enter, follow our blog via GFC and like Luminess Air via Facebook and comment below. Disclosure: ABCD Diaries was given an airbrushing kit for review purposes only. We were in no other way compensated. The opinions expressed in this post are ours and ours alone. GFC follower! And I like Luminess on FB! I follow your blog on GFC and like you both on Facebook! I would love to win this! Thanks so much for the fantastic giveaway! I entered your Super Sorting Pie from Learning Resources GW! I entered your MI-DEL Cookies GW! I entered your Fall Fashionista Giveaway-BEARPAW Boots GW! I entered the Fall Fasionista giveaway. I entered the Cherry Pomegranate Habanero Sauce giveaway. I entered the Furniture Fix! giveaway. I entered the Super Sorting Pie giveaway. I entered the VeggieTales DVDs giveaway. I entered the Cranium Brain Breaks giveaway. I entered the Devo Olive Oil giveaway. I entered the MI-DEL Cookies giveaway. I entered the Beauty Rescue Kit giveaway. I entered the Junior Mystery Quest DS giveaway. I entered the Avery Sticky Notes giveaway. GFC - ArtsyChaos and following Luminess on FB as Wendy R.
Following @ABCDDiariesMom on twitter as @ArtsyChaos. Entered your Fall Fashionista giveaway! I entered the fall fashionista's giveaway. GFC LisaMarie Fan of sponsor Lisa W.
Thanks you for this opportunity! Entered the Fall Fashionista Giveaway! I follow you on GFC. I liked Luminess on facebook as Susan Chester. I follow your blog and like Luminess on Facebook. I liked Luminess Air via Facebook. Entered the Devo Olive Oil giveaway! Entered the Spooky Scavenger Hunt giveaway! Entered your Harvest Halloween Hop giveaway! Entered your Darryl Hall giveaway! Entered your Veggie Tales giveaway! Entered your Christmas Classic Box Set giveaway!